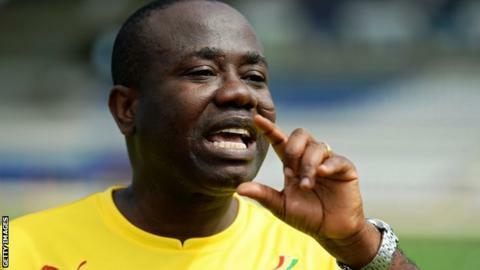 The president of the Ghana Football Association Kwesi Nyantakyi has demanded more respect for Africa from fellow Fifa members. His calls come after criticism in certain quarters that African FA's backed Sepp Blatter in his re-election as Fifa president last Friday. "It's very irritating for someone to ask me why I voted for Blatter - why shouldn't I?" Nyantaki asked BBC Sport. "I think it's a case of a lack of respect for Africans." The president of the Ghana FA, Kwesi Nyantakyi, says Africa deserves more respect from fellow Fifa members. Nyantakyi continued: "People don't think we are capable of forming independent opinions and thinking on our own. "They think Africans are corrupt and have to be influenced to make a decision. "This is very unfortunate and I think there is a need for more respect for Africa and the fact that we can take our decisions. "We take decisions on the situation on the ground by looking at the pros and cons before appraising it critically and whether it will benefit us one way or another." He was speaking after the arrest of several Fifa officials, on behalf of US authorities, last Wednesday on charges they received more than $150m (£100m) in bribes. Every country is equal before football and that is very good - let's continue like that. A separate criminal investigation by Swiss authorities into how the 2018 and 2022 World Cups were allocated has also begun. Nyantakyi is also upset at the suggestion that the so-called bigger nations should have more say in the running of global football. "I think they want to push a United Nations system and create [something like] a security council and invest some with the power of veto," he continued. "We don't need that in Fifa - [the current system] is what has bought unity and development in football to this level. "I don't think that countries in Europe are bigger than all the countries in Africa in terms of economic might or even in terms of soccer prowess and so forth. "There are teams like San Marino who get beaten 6-0 in World Cup qualifiers and they are all playing. "We also have smaller countries in Africa, Concacaf and Oceania but the beauty of all is that football preaches equality. "Every country is equal before football and that is very good - let's continue like that." Nyantaki feels that any major changes within football's world governing body will cause more problems than they solve. "To begin to make unreasonable requests such as investing some countries with the power of veto or giving them more votes than the smaller countries in Africa will begin to shake the very foundations of the values Fifa is built on," he insisted.